High Winds Damage Airplanes in Stillwater | The Voss Law Firm, P.C. Some flight students at Oklahoma State University may be facing some delays and setbacks in their training after severe storms and high winds affected a local airport. KOCO News in Oklahoma City reported that several planes were damaged overnight on Thursday, September 10th, at Stillwater Regional Airport. Lance Fortney, the flight program’s manager, said that some of the planes were not in the hangar during the storm because the full fleet doesn’t fit well inside the hangar and severe weather wasn’t expected. The planes were tethered to the ground outside. Five planes were damaged in the storm, which included winds at speeds up 70 miles per hour. Fortney says that much of the damage was caused by the high winds tossing the planes around, smashing them against each other and the ground. One plane was torn from its tether and moved several feet by the high winds. Two of the five damaged planes will need to be replaced, which will cost about $370,000. With all damage accounted for, according to a report from News on 6, the estimates for repairs and replacement could run up to about $1 million. The planes used in the flight program are insured, however. Along with the damaged planes, a hangar at the airport also lost part of its roof in the strong winds. There were power outages in the area around Stillwater Regional Airport, and at least one home was damaged. Thankfully, there were no reported injuries. Strong windstorms are always a threat to airports, planes, and hangars, and the losses can be extremely costly. 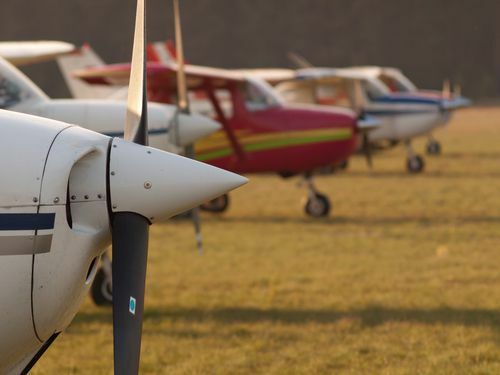 Damaged planes hinder transportation and training, and damaged hangars and equipment can create setbacks while policyholders wait for the claims process to resolve. Unfortunately, while individual policies may cover losses sustained in windstorms, there are still times when policyholders are unable to get full, and fair payment of their insurance claims for wind damage. If your insurance claim for losses related to a high winds and severe weather are denied, underpaid, or unfairly delayed, you should take the time to learn more about your rights as a policyholder. Contact our law firm today at 1-888-614-7730 for a free and experienced review of your property damage claim and more information about the options available for maximizing and resolving your claim.